The WinISD Pro application was designed to be a freeware speaker designer software. You will be able to design Closed, Vented, Bandpass boxes and passive radiators with this program. It also allows you to calculate few different types of filters. Is freeware speaker designing software for Windows 9x/NT environment. 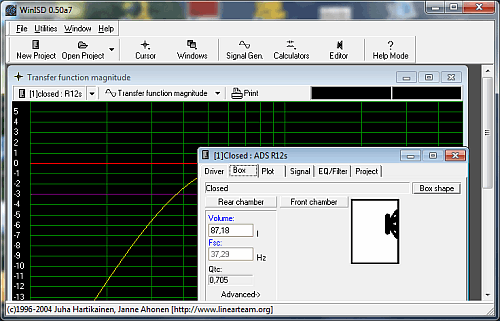 You can design Closed, Vented and Bandpass boxes with this program. It also allows you to calculate few different types of filters. WinISD Pro a free speaker designer software that also allows you to calculate few different types of filters. · Added simulation of various types of prototype filters. This is very nice feature, since now you can add various combinations of these filters, and see their combined impact on frequency response (magnitude and phase), cone excursion and group delay. You can also plot frequency response or group delay of equalizer/filter chain.